The Traditional Lindian House with hand carved woodwork and original 'chochlaki' (pebbles) mosaic floors. The entrance to the house through the original wooden arched doorway opens into the lower courtyard.The villa offers 5 seperate studios . The patio is built in two levels. 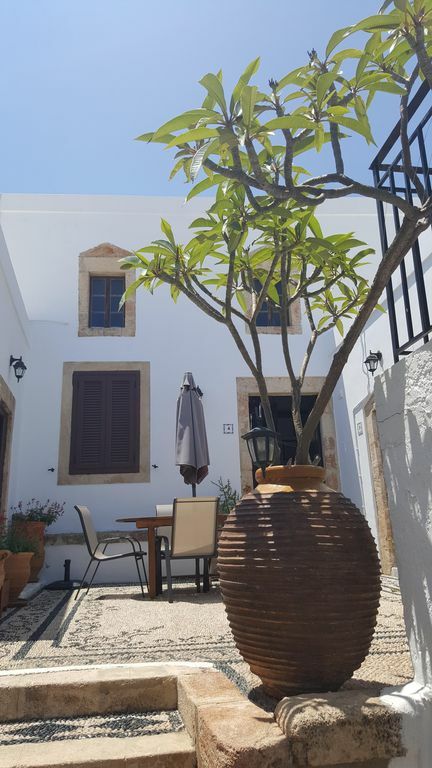 The studios on the first level, one large sala , one bedroom and a studio with private courtyard, are furnished with the traditional wooden pangas (Lindos bed),the same are and the other 2 on the second level . All studios have their own air-condition,safe boxe, open kitchenette and bathroom (shower - w/c). The kitchen is equipped with cooker, small oven, fridge/freezer and a kettle. Notes on accommodation: Air-conditioning & safe boxes are included in the price. If possible when booking please advise of flight number and expected arrival time in resort. Could be dangerous for small children for it's stairs and railed terraces. Outside: Large courtyard with 'koklaki' and roof terrace with magnificent view of the Acropolis of Lindos, ideal for dinning. Cleaning / Towels / Linen / Maid service: Every second day the maid cleans, towels and linen are changed twice a week. Other: All Traditional Studios included air-conditioning & safe boxes. We travel in Lindos for holidays and for vaptism. The Villa was excellent and very traditional ,as it looks. we had the whole 5 rooms , as we was 10 people + children. We had the vaptism at the Sts Paul Church and then we had nice , relaxing time at the Villa (terrace) , drinking and eating with the view of the acrpolis. Lindos is a great Village with a lot of shops, restaurants, bars etc. Nice place to have relaxing holidays and the villa was almost 2 minutes from all of them. The best positive thing is that the property is next to Stavri square wich is a parking area, that you can park your car or bike , and there is the atmoshere bar that we had breakfast , drinks and snacks all the day long. We loved the place and for sure we will go back again. There are 3 beaches in Lindos all sand, St Pauls, Pallas Beach and the main beach all with tavernas, shops and water sports. Alternatively a 8 minute drive to Pefkos Beach again sand with tavernas and shops. Diagoras airport is 52km from Lindos/about 50 minutes driving. Main port of Rhodes ia about 49km from Lindos/45 minutes drive. Rhodes: 45km. Old Town: 45km. Casino Rhodes: 45km. Aquarium: 45km. Kalithea Spa: 38km. Butterfly Valley: 23km. Seven Springs: 21km. St Paul's Bay: 8 minutes walk, Pefkos resort: 8 minutes drive, Lardos village: 10 minutes drive. Lindos is full of restaurants, supermarkets, bars, pharmacy, banks and gift shops, are within easy walking distance. Villa Located next to Stavri Square which is a parking area for your comfort. Booking Notes: The payment is 30% deposit at the day of the booking and the rest of it will be paid when arriving at the villa. Changeover Day: Changeover days are flexible. Notes on prices: Prices per week are for the whole property in Euros and apply for 10 guests. Every extra person is being charged 100 Euros per week. Prices per night are for single Studios in Euros and apply for 2 guests each. Every extra person is being charged 15 Euros per night. Ask us for our special prices/offers per night/per week. Air-conditioning & safe boxes included.